United climbed to third place in the Scottish Championship with a comfortable 2-0 win over struggling Falkirk at the Falkirk Stadium. Despite the lackadaisical performance in the previous week’s game against Morton, as well as the rumours about his own job security, manager Csaba Laszlo resisted the temptation to make wholesale changes. Only two changes were made to his starting eleven from that Morton game. Paul McMullan made his first league start of the season, and Jamie Robson also returned. Callum Booth and Adam Barton were dropped to the bench. 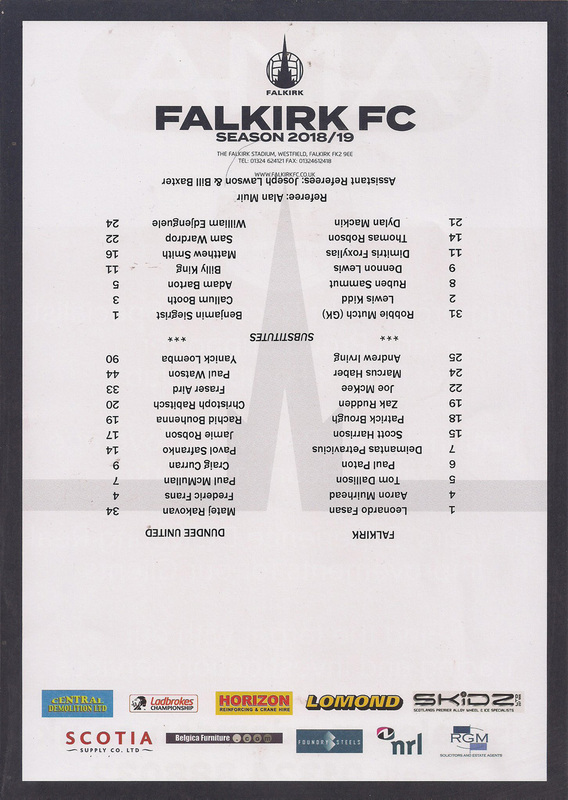 Fraser Fyvie, perhaps with Falkirk’s artificial surface in mind, dropped out of the squad altogether although Billy King, who was also returning from injury, was named among the substitutes. Falkirk went into the game without a single point, and had former United manager Ray McKinnon in the dugout after his brief spell at Morton. Despite only being three points from the top of the league, good performances had been at a premium for United so far this season and they were under huge pressure to get the three points. United started the game with a 4-1-3-2 formation, with Fraser Aird playing at right back and Rachid Bouhenna in a holding midfield role. Some good build up play from United in the second minute saw Jamie Robson get to the goal line but his cross was overhit and evaded the United players in the middle. The away side tried to seize the initiative with Fraser Aird and Yannick Loemba also having good crossing opportunities in the first few minutes, but Aird’s cross was collected easily by Falkirk goalkeeper Leo Fasan and Loemba’s cross being cleared by the home defence. In the eighth minute Rachid Bouhenna did well to win a free kick around 35 yards from goal. The Algerian took the free kick himself but drove the wall wide of the post. Loemba had another cross blocked by Fasan a minute later before Pavol Sanfranko had a glancing header from a Fraser Aird corner kick flash just past the post. Within a minute, Christophe Rabitsch became the latest United player to try his luck, with a volley from just outside the penalty area, although he could not get his attempt on target. Remarkably, these opportunities for United all came within the first twelve minutes of the game. 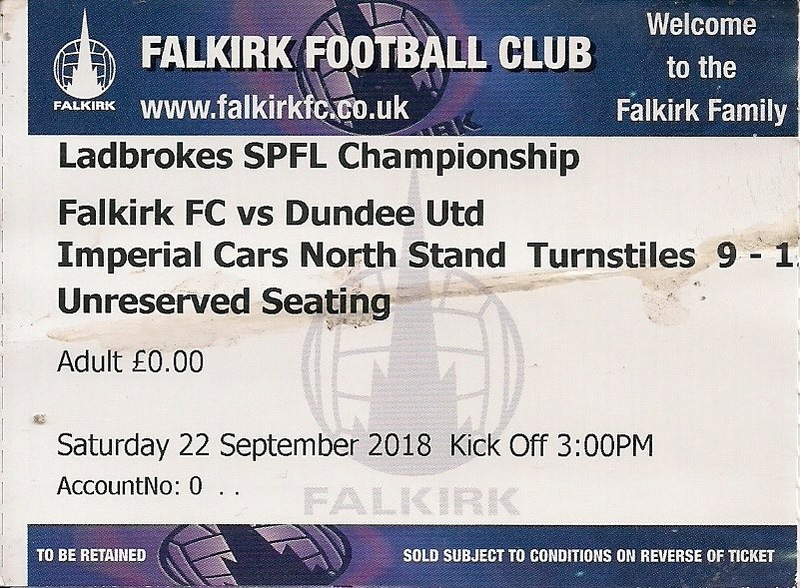 After such a whirlwind start, albeit one without a goal, Falkirk were always going to come into the game, and they had their first half chance after 16 minutes, although like United they could not get their effort on target with Zak Rudden heading the ball just over the bar after meeting a long throw in and beating Frederic Frans to the ball. The game rather hit a lull at this point, which was perhaps inevitable after the start United had made. Yannick Loemba did get himself into another good crossing position on the 25th minute, but again his cross evaded his team mates in the middle. However, the lack of creativity in the team was beginning to become apparent once again, and even at this relatively early stage it did look like the away side were beginning to run out of ideas. They were continuing to get into decent crossing positions, but by and large the crosses were not being exploited, shown again by a Jamie Robson cross from the goal line after half an hour which again had no takers. A short corner routine a minute later from Yannick Loemba and Paul McMullan saw the Congolese player cross the ball into the box, but Leo Fasan was again able to gather the ball. A minute later, Deimantas Petravicius burst down the right to win a corner for the home side. From that corner the ball dropped to Zak Rudden whose effort was blocked by the United defence. Tom Dallison then headed the ball past the post from another Falkirk corner, as the home side came more into the game. With ten minutes to go until half time, United nearly got a helping hand when a Paul McMullan low cross was nearly turned into his own net by Dallison, but the ball went just wide for another United corner. That subsequent corner kick came to nothing. Four minutes before half time, Loemba wasted a good chance by blasting the ball over the bar after being played through on goal by Pavol Safranko. Falkirk broke up the pitch and Deimantas Petravicus forced Matej Rakovan into his first save of the match, the Slovak goalkeeper getting down low to parry the Falkirk player’s ball across the six yard box. That was the final action of a first half which somehow ended goalless. Neither side made any changes for the second half. After five minutes United had a chance when Pavol Safranko knocked down Fraser Aird’s cross for Christope Rabitsch, but the Austrian’s shot was blocked and another corner was the result. However, Falkirk broke away from the corner and nearly scored themselves. Again, it was Deimantas Petravicus causing the problems for United as he cut inside and hit a low shot which Matej Rakovan did well to block. However, he could only parry the ball into the path of former Dundee striker Marcus Haber, and as he tried to pick out Zak Rudden for a tap-in the ball was blocked almost on the line by the retreating Jamie Robson. United looked like they were again struggling at this stage, but on the 59th minute they took the lead. 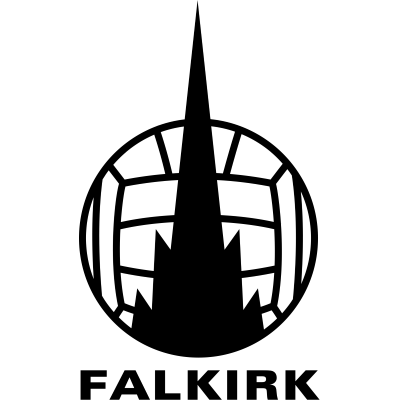 Fraser Aird hit a cross from the right, and as Falkirk goalkeeper Leo Fasan charged off his line to try and win the ball Pavol Safranko outjumped him to nod the ball into the net. It seemed naïve goalkeeping at best, but Safranko did well with the header nonetheless. The home side reacted to the goal by making a double substitution with Dennon Lewis and Lewis Kidd replacing Andrew Irving and Marcus Haber. There then followed a remarkable minute of football during which both sides should have scored. Firstly, Yannick Loemba skinned his man on the bye line and hit a fierce shot which Scott Harrison did well to clear off the line, then Falkirk broke up the park and a shot from Petravicus in the centre of the goal a mere six yards out somehow went just wide when it looked easier for him to score. That chance emphasised that despite their poor form the home side could not be dismissed, especially given United’s poor record with defending leads so far this season. 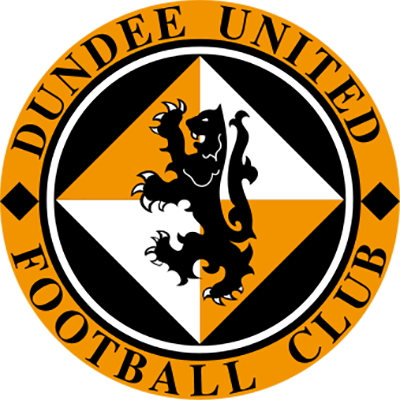 After 70 minutes former United player Paul Paton released Dennon Lewis on the left, but his ball into the box was well held by Rakovan despite the presence of Zak Rudden. They had another chance after 72 minutes when Dennon Lewis delivered the ball to Joe McKee in the middle who headed just wide. Yannick Loemba then failed again to take advantage of getting himself into a good position when he cut inside and mishit a shot, which trundled through to Leo Fasan. 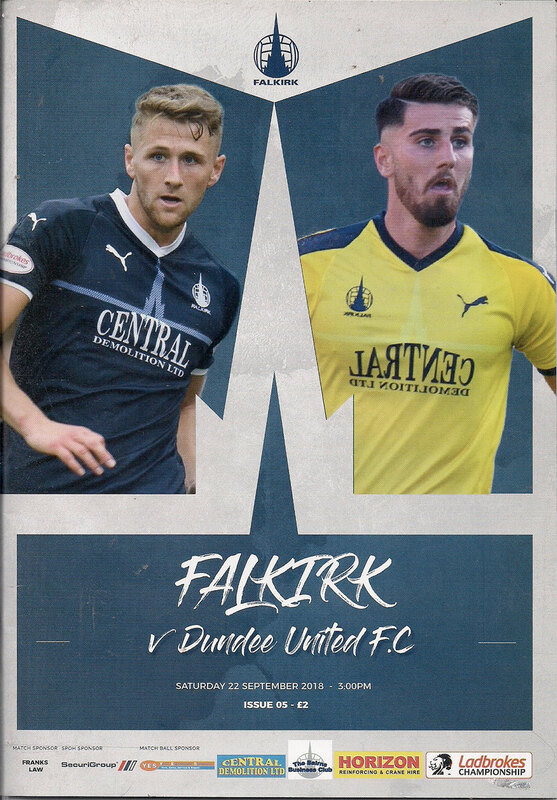 Paul Paton had an effort on goal well held by Rakovan after 78 minutes as Falkirk sought an equaliser, and United, not for the first time this season, sought to protect a one goal lead as the game drew towards its end. This tactic nearly blew up in United’s face again with twelve minutes left as the ball fell to Joe McKee 5 yards from goal, but Rakovan did brilliantly to block his shot from point blank range. Rakovan required treatment after that save but was able to continue after a couple of minutes of medical attention. McKee was almost immediately replaced by Tommy Robson as Ray McKinnon switched to a back three for the last few minutes. With four minutes left, United could breathe a lot more easily as they clinched the game with a second goal. Yannick Loemba got another cross into the box from the United left hand side after his free kick from out wide was charged down, but this time was able to find a team mate as b>Craig Curran stole in at the near post to flick a good header over the stranded Leo Fasan to double United’s lead. Scott Harrison then headed wide from a Falkirk corner as the home side tried to get what surely would have been a consolation goal, but after that there were no further chances and United held on for a 2-0 win. Although the performance could have been better, there was no doubt United were the better team on the day and the victory left them two points away from the top of the Championship table after six games. In addition, it was United’s first clean sheet of the season in the league.